This handmade necklace reflects the beautiful journey from woman to mother to grandmother. 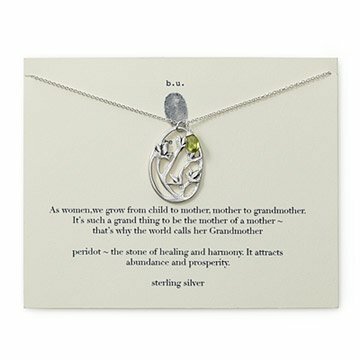 Invoking the beautiful journey from woman to mother to grandmother, Mary Steratore"s necklace features a floral sterling silver charm and drop of bright green peridot. A fitting tribute to the love shared by women across the generations, peridot is the stone of healing and harmony, attracting abundance and prosperity. The openwork silver medallion shows how new growth springs from a common stem in another fitting symbol of the generations. This sweet accessory makes a thoughtful gift to honor any grandmother. Handmade in the Pennsylvania. Clean with a silver polish and a soft cloth. Lovely necklace but stone fell off right away. Christmas present from my daughter. Lovely necklace but stone fell off right away. I am really disappointed. I purchased this as a gift for my mom for mother's day. She really liked it, however the stone fell off and was lost within a couple days. It is a beautiful necklace. I gave this to my mother for Mother's Day. She loved it!